The last time I had listened to Weezer's self-titled debut album was when I was still in college. Not too long ago, but not exactly recent. The album has an incredible amount of emotional baggage tethered to it, so as much as I've enjoyed it over the years, I've drifted away from it. It was like dusting off a photo album; some of the photos were enjoyable when they were taken, but looking at them years later is painful in some ways. The bad haircut you had, pimples, friends that've drifted away. But the photograph is still wonderful. You can see how things have changed, and hopefully value the trials and joys that've come since. So though the guitar tone on the album may now sound too much like AC/DC for my taste, and though I now realize how sketchy Rivers Cuomo's voice is, I still sing along to every track. I know all of the vocal cracks, all of the guitar solos, all of the unhinged harmonies. And "Only In Dreams" is still a beautiful, beautiful song. And on this same day, I got a copy of the newest album by the National, called Boxer. I really know nothing about the band, but gave it a spin on a friend's recommendation. It's great--as trite as it might sound, it's mellow and intense simultaneously. The vocalist has a lazy baritone that drifts over the rest of the music--lush, crackling guitars and light piano accents more often than not--before settling down. I don't even know what to compare them to. That's good, right? Names that jump to my head: Leonard Cohen, the Church, Joy Division, Nick Drake, U2 and the sorely under-appreciated Spain. It's a warm album, layering like a blanket that's soft to the touch. The softer songs crackle with a vibrancy, the fast 'loud' songs more hushed and subdued. Maybe when I dust Boxer off in 2010, I'll notice the spots and flubs. But by then, we'll be close enough friends that it shouldn't matter at all. I'd seen this game floating around on before, but never did it until now. Interesting, to say the least. 6. Don't lie and try to pretend you're cool... DON'T CHEAT! Wow. Wow. Why don't I do it again? Much better that time! Your turn! The 'holy trinity' of crime authors had their varying strengths. Raymond Chandler was a master at his craft, wielding descriptions and dialogue like a champion fencer would a foil. James M. Cain was blunt, his bleak stories painting the oft-guilty narrators without a shred of sympathy. 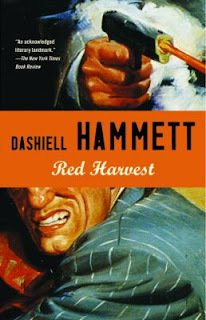 Dashiell Hammett, in many ways the grandfather of all things pulp and noir and detective story, was immediate in his writing; he never beat around the bush, his dialogue as brief and punchy as the action. The plot is something of a fix-up, tying three similar short stories together into one novel. The novel is narrated by reoccurring Hammett character the Continental Op, a nameless and amoral private detective based out of San Francisco. After being summoned to Personville (Poisonville to the inhabitants), the Op is caught up in the investigation of the murder of his client. Seeing how deep-rooted the corruption in the city is, he forges ahead and creates a four-way war between the various criminal elements and warped police department. The result is utter bloodshed. The Op wouldn't have it any other way. Hammett is a good writing, sticking to a meat-and-potatoes approach. Brevity is key here, and the short blurbs of dialogue or description hit like a sledge. This works well with the Op's internal monologues--they're more like snippets of thoughts, brief mullings that lead into verbal sparring or bullet dodging. The Op is an interesting character; he's so damaged by his job that his actions--which fall heavily in gray areas--don't seem to register to him until he pauses to have a drink or fall asleep. He exists in a very moral world, but in a spectrum that most readers aren't used to. P.S.-- the list of movies influenced or inspired by this novel are endless: Akira Kurosawa's Yojimbo, the Coen's Miller's Crossing (one of my favorites), Last Man Standing, Sergio Leone's A Fistful of Dollars, and so on and so on. I've been biking around College Hill at night for the past week. While I've gone a few times by myself, I've had the most fun when I've gone with my friends Wendy and Brett. We don't spread too far out--we mainly stick to College Hill, stretching from 29th St. to maybe 40th St. (whatever those blocks are that are past BCCS). We cross Route 18/4th Ave a fair bit. We have fun too, singing and high-fiving and racing each other. There isn't much traffic and the air is cool, running her fingers through my hair. Biking around was a good way to wind down, especially after my botched attempt to bike to Wal-Mart in the early evening. I'm not sure why I decided to do that; I needed groceries, for one, but it might've been one of those I'll-do-something-crazy-and-try-to-feel-cool things I do from time to time. I probably should've bowed out before I even started; after mentioning to a friend that I was shaking in fear, she said maybe that means something. I didn't want to go up 37th St. Ext. (a long, windy road that leads directly to Wal-Mart, but has LOTS of hills and blind spots), so I decided to try going up another set of longer, more indirect roads that would avoid some of the traffic. I think I made it maybe 1/3 of the way before my legs were quaking from over-exertion, and I had had enough close-calls with speeding drivers that I was literally terrified. I turned the bike around and went home. I nearly passed out on the way back. But it was fun in a weird way. I want to keep cycling at night, though, even if I'm not in any shape to bike to miles and miles up tall hills. Cycling at night is fun, and cycling at night is still a work-out. In a way, I think my ultimate goal is to use cycling to build up my stamina so I can actually run. Maybe I'll just do both. I think I'm officially drained of post ideas...I need inspiration. I also need to sleep. Had he not died of stomach cancer in 1979, John Wayne (born Marion Morrison) would've been 100 years old today. Though a knucklehead off of the screen, Wayne--the actor Wayne--had a profound impact on me growing up. Still does, in some ways. Two of my top ten favorite films have Wayne in a leading role (She Wore a Yellow Ribbon and the Man Who Shot Liberty Valance, both amazing films). He certainly did his share of terrible films (the Conqueror! ), Wayne played some fine roles in his career. 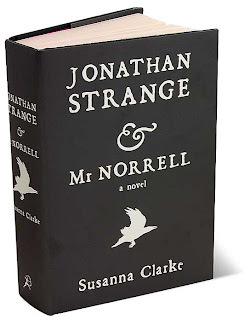 Jonathan Strange & Mr Norrell is a rare debut novel--I cannot think of one criticism, let alone many. And--after finishing the last of the 846 pages in my trade paperback copy--I pursed my lips and said something under my breath about Susanna Clarke and how she should have written 100 or so more pages in the novel. Saying that Strange & Norrell is like "Jane Austen meets Harry Potter" is fairly apt, but not entirely fair; if anything, the description begs elaboration. Set in England during the early part of the 19th century, the novel roots itself firmly in Austen's 'comedy of manners' tradition (there are even countless era-appropriate footnotes dotting the bottoms of the pages). The writing feels like it was written during the Napoleonic wars, in fact. The story focuses the return of magic to England and the quarrelling of the two magicians that initiate the return (and the Harry Potter comparisons stop here). One is Gilbert Norrell, the other is Jonathan Strange. Norrell is an aging and fussy scholar that is overly cautious in his approach to everything. In addition to immediately offering his aid to Parliament, Norrell is mostly concerned with making sure no one else becomes an English magician. He buys every book on the subject (and I mean every book), and runs every "theoretical" magician out of town. Except for Jonathan Strange, an aloof and absentminded young man of pure talent--through an interesting chain of events, Norrell delightfully takes Strange in as his pupil. But as they both have different ideas regarding England's best interest regarding magic, things go downhill drastically. Clarke introduces a warm and heavily developed supporting cast-- Childermass, Norrell's surprisingly independent and talented servant; Stephen Black, the black butler of a local nobleman who gets tied to a vital subplot; the "gentleman with thistle-down hair," the psychotic fairie that serves as the novel's villain; Arabella Strange, Jonathan's whimsical and loving wife; and so on. But the most significant presence--and it's one that's more felt than shown--is that of John Uskglass, the Raven King. A legendary and shadowy magician during the 12th century, Uskglass ruled for centuries and created all of the known magic in England. Norrell fears his name; Strange is drawn to it. And this division is where the novel really shines--the two title characters are shown to be flawed men, their differing opinions on the Raven King serving as a focus of sorts for the arrogance (Strange) and fear (Norrell). These two men are so well-developed that, by the end of the novel, you hate to finish; you've learned so much about them, their mistakes and blunders and their triumphs, that they feel like family. Clarke's handling of the magical elements is excellent--it's nearly scholarly, often funny and matter-of-fact (some of the characters in the novel are so English it's incredible!). But it's still magic; Norrell fools the French by creating British warships out of rain, and Strange eventually learns to travel throughout the countryside via mirrors. Jonathan Strange & Mr Norrell isn't an angry allegory about the Iraq War or a winking parody of old literature. It's a deeply complex, incredibly well-written story that feels short at almost a thousand pages. It's about dangers of hubris and mistrust, the power of forgiveness and friendship, and simple power of story. Read it. My work in a coffee shop has illustrated how needy laptop computer users can be (whoa whoa whoa...before you cry 'foul,' I'm probably going to join the laptop ranks in a few months; I'm writing this with that perspective in mind). A coffee shop table can usually fit multiple people, or one person with a laptop. Let's say that a coffee house's main room can seat sixteen people at four tables...sixteen people OR four people with laptops. Laptop users tend to create this funky miniature universe on their table, a Mac-fueled recreation of the Chicago suburb sprawl. Cords and iPods and power adapters and carrying cases. And this is OK. I just think it's sort of funny--I was reading during a busy spell at a, uh, certain coffee shop today, and customers kept peeking into the next room to see if they could find a seat. They were swatted away by the four guys who had staked claims on the four tables, their sympathetic looks suggesting, "Oh geez, sorry I'm taking up so much space...if I only didn't have all of these cords and bags and messenger bags and iPods and etc. etc. etc." As a relentless people-pleaser, I hope that when I get a laptop, I'll, like, wedge it under my arm or something, or balance it on the corner of the table. Or just not use it at all. So why do people in Beaver County love kick lines so much? Sportcoats. The word invaded my head last week, coupled with an image of me walking around in one. A tan one, patches on the sleeves, a plain black t-shirt and jeans serving as foil. I'm not sure why, but I had this Kevin Kline-meets-David Kuhns vibe, casual but endearingly smart (in a fashion sense). I walked to the thrift store on Monday. Good exercise, but all of the sportcoats were teal. Ick. Today I had to drive out to the mall area, so I checked all of the stores: Boscov's were too expensive ($149 on sale! ), J.C. Penney had zip (they sort of had one, but it looked as if it were made of seaweed wafers), Target had zip. Macy's, however, had a great coat--perfect fit--for $49.99. And it was 20% off all Sportcoat day (May 22 only!). I got a killer sportcoat. And I shall wear it. The 21st, specifically. No Country for Old Men hits the screens on that day; it's the adaptation of Cormac McCarthy's novel by the Coen brothers. In other words, a film adaptation of a novel by one of my favorite authors by my favorite contemporary filmmakers. Whee! The good reports just keep rolling in. I made a big decision today. OK, maybe not-so-big: I want to get more Ikea furniture. I already own a small bookshelf I got at Ikea last summer; I like it a lot. I also have a few odds-and-ends things around my place from Ikea. I just love their utilitarian, plain design. It's wonderful. There's a big bookshelf at my old apartment that I had originally planned to move to my new place. But you know--I have a few friends who might be able to use it better (and, failing that, a soon-to-be-married brother who might be able to use it). I think all of these books still piled on my floor might have a new Ikea-furnished home soon. Pick three of your favorite books--novels, non-fiction, you name it--and pick one nuance about each of those book that you really appreciate. It can be a stylistic aspect, a thematic approach, the way the author uses a certain word. Tell us about them. I'll add my three tomorrow. I finished my breezy summer mix CD! I can't escape thematic elements, so I tried creating the entire selection of songs around a mild--possibly hot on occasion--summer day. The first few tracks were arranged to mimic a comforting sunrise, the last few a pleasant evening outside. The rest just sort of fell in place. A few (namely the Bedhead track and a few others) were chosen mostly for instrumental aspects and not necessarily lyrics. Lots of the songs have "summer" in the title, but the rest just remind me of summer, with sun caressing my arms, wind brushing aside my hair. And yes, I still think of mix CDs with "sides." The joke was pretty asinine, I realized, which was fairly common for me. But I think that I was saying it to a mentor-figure, one I truly love and value...that made it click: I try to be funny too often. Which is probably why the mentor-figure just stared at me. The quip wasn't funny--well, maybe a little--but I insisted on sticking with it, pressing home that it was something worth laughing about. I'd like to think that I have a good sense of humor: sometimes simple, deadpan when necessary, based on nuance and lightheartedness. I don't know when I fell into the trap of un-needed urgency, complexity or grim laughs, but I want out. So the CD purge is almost complete. I have the ones I'm going to keep; a few more I know I'll be able to trade in for cash at FYE, and a stack that FYE doesn't seem to want. So maybe--just maybe--my friends will want them? If you see something here you'd like, I'll take a dollar for it. If you want to offer more, I'm game, but I have no desire to take more than three dollars for a CD. That feels like robbery (especially considering some of the--eek!--CDs). Many of these are obscure; not only did I make it a goal to get every CD by a band I liked, I would also scour used CD stores for stuff that looked interesting. Sometimes it work, sometimes it didn't. I wanted to link all of the titles to info about the albums or write up some layman's blurb for each band ("summer-y country rock!" "angry girls from the '90s!" "terrible local emo! ")...but this is just too much work right now. Better Than Ezra-- How Does Your Garden Grow? I shut the lid on the mailbox and realized I had become my father. At least regarding my handwriting. I had just mailed a support letter for a friend that's doing missionary work aboard, and when filling out the form I had used meticulously-penned capital letters. My father does the same thing--he uses only capital letters, using a slightly larger letter for what would normally be capitalized. It effectively looks like machine wrote it, which he likes. He and I would bicker about our writing styles. Dad would say his way was very legible and therefore very sensible. I would say my way looked cool. I stopped using cursive years ago, and--weird story--I completely re-invented how I print in the transition from middle- to high-school. All I did in my spare time in 8th and 9th grade was listen to the Smashing Pumpkin's Siamese Dream album. All of the text on the album was in this neat-o font (Lansbury, I think), and I remember slowly turning my average-12-year-old handwriting into something overly quirky. Embarrassing example: my team lost a speed-math game we played in Advanced Algebra in 8th grade because it took me forever to write out all of the words and numbers. At least it looked cool, with all of the ornate hooks on "H"s and the loop-arc-y "a" you often see in typeface. I still do this to a degree, though the need to put pen on paper quickly often supersedes any desire to make my handwriting elaborate. Which is why I think I unconsciously drifted to writing in all-caps for addresses on envelopes and official forms--I can do it swiftly WHILE adopting that machine-like visual sense my dad championed about a decade ago. Thanks to an uncommon streak of observantness (is that a word? ), I've noticed that several friends have handwriting that's an awful lot like their parents'. I think this is really cool. I just hope that if--when--I start using cursive again, it'll look something like my mom's beautiful handwriting. I can only hope. Wilco's sixth studio album, Sky Blue Sky, comes out tomorrow. Despite my new no-CDs/DVDs-buying diet, I might get it. Regardless, AOL has the album streamed in its entirety today. It's good; like all of the previous Wilco albums, it's a grand departure from the last release. Avoiding the noisy fusion of avant-garde and classic rock of 2004's A Ghost is Born, Sky Blue Sky settles comfortably--very comfortably--in this mid-'70s AM radio rock groove. In other words, it sounds a lot like the Band or electric-era Bob Dylan, with gracious helpings of Beatles pop and jazz rock thrown in. I'm sorry if that's too technical-sounding. It sounds a lot like breezy, back-porch country-rock with some soul and flair. Or you can listen to it all here. I don't know how long it'll be up--my guess is not for long. You have to scroll through the album selections up top to pick it. It's the last one with the static-filled cover. Mind you, there are a few songs that I don't like ("Shake It Off"), but a few--namely "Either Way," "Side with the Seeds," and the lovely album closer "On and On and On"--might get stuck in my head for a while. An editorial in a late-March issue of the New York Times Book Review caught my interest; the author reflected upon some of her experiences with the mistreatment of books. One story included a hotel housekeeper who chastised her for leaving her dog-eared paperback novel folded over on the nightstand, the spine creased to the snapping point. There are the bibliophiles that keep their books as pristine as possible, and those that let the wear lovingly seep in. I had always been in the former camp; even nicks on the corners of pages or scuffs on the outside jacket made me pout. You don't even what to know what my thoughts were on people that (shock!) wrote in books. I lent my beloved copy of Flannery O'Connor's collected short stories to a friend in December, and it was recently returned to me (after switching hands several times). It looks like someone ironed six months worth of dust and grime into the now-warped cover, and the pages are thoroughly scuffed. This would've caused an undue amount of stress a year ago--maybe even several months ago--but now I say, "Good." I'm still going to take care of my books. But if reading them causes them to take some damage, so be it. This especially goes for books I lend--the entropy suggests that a friend might've actually read it and loved it instead of letting it sit on their nightstand for a month before returning it as an act of guilt. And I may just start writing in my books. Been to the "G." Ever. Been on top of Old Main. Stepped on the rug. Ever. Maybe ever. Been to the bell tower of the McCartney library. Been to a Geneva baseball/softball game, tennis or soccer match, volleyball game or track meet. As I've been sorting through all of the CDs I'm getting rid of, I've been reintroduced to scads of great tunes I had forgotten over the past few years. One was a song called "Homesick" by the band Soul Asylum; granted, I'm not keeping the album from which the song originates, but listening to it on my computer made a few things click in my head. I'm not entirely sure what Dave Pirner was intending with his word choice, but it eversomuch struck a chord with me. I spent the bulk--24 years!--of my life calling Hopewell Township home. In theory, at least; it never felt like home. When I go back to Hopewell, I get distressed or anxious. Sunlight seems to linger around strip malls and rushed landscaping jobs, like some divine spotlight pointing out the blight. Hopewell is the worst suburbia has to offer, and I still hesitate before going back to visit my family. And I suppose this is weird. Many youth grow up to consider the home of their childhood as "home." I cannot do this. I feel more welcome in Denver or Grand Rapids, two cities in which I've spent limited amounts of time (this could also be because they're both incredibly welcoming cities). Regardless, I didn't think I would ever be able to feel totally welcome, no matter where I lived. But I think I'm ready for Beaver Falls to be my home. I'm slowly learning more about my neighborhood: the way certain trees arc over the street, which houses have which dogs, how the dips in the sidewalk angle. And I have to the desire to give to the community; I just want the community (if that makes sense). I have a few friends--one in particular--that have recently moved Beaver Falls, but are still homesick in some ways. I really want them to embrace the area. But I think I need to do that first, and believe me--I can relate to them in a way. I've been homesick my entire life. -- Apparently, the Coen brothers' upcoming No Country For Old Men will be almost entirely without a score. That's a bold move. Carter Burwell--the composer they've used for 11 of their 12 films--is using an ultra-minimalist score that blends in with the movie's sound effects. -- George Lucas calls Spider-Man 3 "silly." Pot-kettle-black? -- Jonathan Strange & Mr. Norrell, the great and imaginative novel I'm halfway through, is slated for a 2008 release on the silver screen. If they do it well, it'll (hopefully) be like the BBC version of Pride & Prejudice mixed with Sharpe's Company, a dash of magic. I think that--after four years--I'm finally starting to kick my horrible sleeping schedule. (Types the man at 1:10 a.m.) I've been getting a fair amount of sleep the past few days; included in this package is going to bed fairly early (meaning before 2 a.m.), and getting up fairly early (meaning between 7 and 9 a.m.). And I've been cooking breakfast. Not that this is that odd, really; I like to cook, but breakfast had been out since I moved since I didn't have a working kitchen until this past week. Morning is fast becoming my favorite part of the day: cook food, read Scripture, pray, exercise, shower, bumble around my room (though I do that any time of the day). While I think the I'm-not-sleeping thing might haunt me for a while longer, I feel like I've made some headway. Maybe those bags under my eyes will be gone before too long. Since it feels like it skipped directly from winter to the early stages of summer, I want to make a mix CD with lots of willowy, breezy songs. The sort of songs that make you want to swing your hammock a little more as the sun sets. If (and this is a big if, since I still don't have my CD burner hooked up) I get the CD made, some copies may be made. While checking a few things online this morning, I found an interview with members from the band Wilco. I really enjoy their music, and recalled seeing them two years in a row at the Three Rivers Arts Festival. And I thought, "Oh, the Arts Festival!" The Arts Festival always seems to slip off of my mind's radar shortly after it happens, the blip reappearing a year later as the festival is scant weeks away. I just checked out the website for the festival; apparently, the musical acts are going to be announced today. I've gone to the Arts Festival the past four years. In addition to a week's worth of free (for the audience at least) concerts, there are lots of booths with some interesting (at worst) to pretty good art. Plus food and lots of other attractions, all spread out over downtown Pittsburgh and Point State Park. At no cost. The musical acts are always good: I've seen Andrew Bird, Wilco (twice! ), Aimee Mann. Plus there plenty of great acts I've missed, from folk to country to rock, and some blues, jazz and zydeco mixed in. One of my best memories was meeting up with an impressive crowd of Geneva alum, most of whom I didn't realize would be there, and then going to a great Indian restaurant after the show with Andrew Heffner and some of the underground Christian coffee-types in Pittsburgh. I can't believe that was almost a year ago. So be warned: many of those reading this will be prodded by me to come. And you'll want to, trust me. With summer creeping near, I've had more thoughts about porches. More specifically, reading on porches. I have two--possibly three (see note*)--porches in my life, and I really want to read on them more often. Porch one: Beaver Falls Coffee & Tea Co.
Pros--in nice location, has really comfy loveseat, in view of pretty flowers and college campus, can see and talk to people easily. Cons-- can see and talk to people easily, can see and hear smoke-belching dumptrucks easily. Pros--in nice location, great for inclimate weather, has pretty backyard, connected to house I'm living in. Cons--possible lack of human interaction, weird lighting at night, doesn't have chairs that are easy to doze off in. In addition to a full-sized bed, dresser, television, fireplace, lamps and huge couch, my new room has paintings hanging on the walls. The largest hangs over my bed. It's pretty noticeable, but in an uncomfortably slight way: I always seem to catch a glimpse out of the corner of my eye. It's like something from an H.P. Lovecraft story, just not as obnoxiously overbearing. Amateur oil paint-marks aside, it's mysterious and intriguing enough to warrant some thought. It illustrates the bend of a cobblestone street through part of a small town, probably circa 1915 or whenever electric lights first replaced oil lamps. The houses are all straight from whatever Hollywood set design ranch made all of the towns for John Ford movies. The ground-floor windows on one of the most prominent houses are lit, probably to be inviting; they instead make it look like the living room is aflame. The opposite side of the street--and right side of the painting--is engulfed by a blazing lamp, tilting a cone of light on the ground in a very film noir way. The entire painting is balanced on a figure walking in the foreground. It's a woman, her face featureless and clothing plain. I can't tell if she's carrying a suitcase, is lifting her bloomers to avoid a weird red splotch mere steps away, or if she just has really huge hands. There's also a horse-drawn cart rolling in the opposite direction, the man at the helm craning his neck around. Is it because he's a pervert? Or is it because she has huge hands, or because he wants a good look as she slips on the red oil slick right in front of her? I do not nor will I ever know the answer to this. Also worth noting: the sky shifts violently from pretty pastel blue to knocking-frigates-against-cliff face-storm blue in the thin margin over the roofs of the town. This must be an exciting place to live! I think I like this painting. A lot. Sometimes I want someone to follow me around and say things like, "Jason, that's a bad idea. Don't do that" or "Jason, you're worrying about that. Try thinking this way instead" or "Jason, I'm going to listen to what you're saying and then I'm going to respond in a kind manner and give you my two cents." By the time the reprise of "Do You Hear the People Sing?" in the finale of Les Miserables, my jaw was clenched tightly to keep the tears from cascading down my cheeks. It had started Monday night, the first rehearsal the orchestra had with the students--I felt a lump in my throat during several of the numbers. And now the almost-tears. It was only Thursday night, too. I knew--I just knew--that by Saturday night I'd have to shut my music stand lamp off so the entire audience wouldn't have to witness me bawling my eyes out. I'm a weepy sort. I cry when I'm sad, but I also cry when I'm really happy, when I've been moved by something beautiful ("moved to tears"), when I'm incredibly convicted of my sinful nature and when I realize how poor of a job I honoring God with my thoughts, words and deeds. I also bawl when I see or read something exceptional: extreme examples of self-sacrifice, strong bonds of brotherly or familial love, and when villains repent of their wicked ways and are redeemed. This is way Les Mis is killing me. The musical is a combination of all of the above; the music especially is emptying my tear ducts. There must be some list of melodies or chord progressions that turn me into a mess. I even have an extensive list of movies I can't watch without crying. Some are seemingly universal in weepiness (Grave of the Fireflies, Magnolia). Others are more peculiar (Gunga Din, when they show Din's super-imposed ghostly face saluting as Rudyard Kipling reads his poem; They Died With Their Boots On has both a romantic scene and musical montage that turn me into a fountain). You could be asking 'Do you get embarrassed?' Maybe a little bit. But not really; I'm emotional in that way, and I'm fine with that. But I seriously do believe that there is some toggle or button on my neck--near the start of my spine--that causes me to cry. I must bump it a lot. I stretch, the muscles tightening in my arm as I reach for the box. I tip the lid off--still on my tip-toes--and fish my hand inside, fingertips brushing against plastic. Surprised I'd found it on the first try, I pull the small box out and brush dust from the lid. It's the size of a child's small lunch pail; the black and white pattern swirls like water rushing down an unstopped bathtub drain, the little metal clasp smiling unlatched. I blow on the lid and clear away the rest of the dust. The first time I had touched the box was in early 1997. I was participating in the annual Boy Scout event at the Beaver Valley Mall--I was eager to save face in front of the shoppers around me, I had clumped by uniform up into a ball next to me on a bench. I had had my first Auntie Anne's pretzel and eyed Sam Goody's Record Store from fifteen paces. Tell my friends to guard my uniform, I marched into the CD store and wound through the aisles until I was near the 'S' section in Pop/Rock music. Smashing Pumpkins--my favorite band, as my much-cooler-than-Scout-uniform t-shirt elaborated--had their own tab. The Aeroplane Flies High sat on the top display. The box. I spent all of my cash on it. Close to $40, I think. For five CD singles (with bonus tracks!) and a special booklet. It seemed like a good purchase at the time. I'm getting rid of most of my CDs. By most, I mean I'm keeping 50 (at most) and selling around 500. It's something I have to do; not necessarily for financial reasons or ethical ones, either. It's just something I have to do, something that needed to be fixed a long time ago. No CD is escaping scrutiny. I've always been a completest with my collection, owning a band's entire discography. Some bands are escaping intact: Wilco, for instance, or Marshall Crenshaw. Others aren't: Afghan Whigs, Built to Spill, the Flaming Lips, Radiohead. All bands I've said "I love" about at one point in time or another. It needs to be done. The CD may scratch, the case may splinter, the music may be forgotten. Every CD and every song has a story attached to it, though; the stories small segments of a bigger story. I want to think fondly of the memories--the stories, the heartbreaks, the laughter and joy--and not get hung up on the circular plastic that brought them here. If you're able, come see Beaver County Christian School's performance of Les Miserables this weekend--it runs Wednesday through Saturday night. It's fantastic! Day 363-- Auralia's Colors out Tuesday!